Photo caption (l to r): President Katie Geise, Betsy Rowe-Baehr, JHS Students - Cayla Overbeck, Emily Crasti, and William Karr, and Amy Rohler. 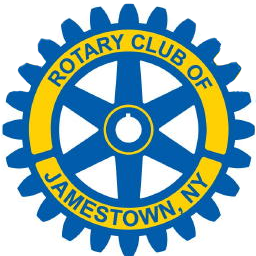 Betsy spoke to the club about an English elective class, called Justice for All at Jamestown High School. This is a class she created at Jamestown Public Schools to offer students an opportunity to learn about social injustices. Her main message to her students is about getting out of the classroom, exploring society and making a difference. Justice for All exists to create a safe, supportive and informative space for high school students. Some have referred to this class as the “empathy” class. Promotes social advocacy and action among high school students. Justice for All is about building relationships, having fun, connecting, interacting, making community partnerships, developing empathy and understanding, and joining a movement! A class to talk about social issues and injustices in our community and in our world as a whole. This class changes students outlooks on the world after they take the class. Allows students to be more accepting of people who may not be like them. There are certain issues in society that still exist – racism, police brutality, poverty, etc. As part of her presentation on Justice for All, Betsy relayed a story about Elizabeth Eckford – whose was part of the Little Rock 9 in the Civil Rights Era who defied school integration standards. Grace Lorch, a teacher, shielded her and protected Elizabeth. The Lorch family was mobbed for taking the risk of helping Elizabeth and eventually had to move to Canada. For years, teens have been instruments in making history and pushing for change. This kind of passion, courage and risk-taking spirit is on the move once again. There is a movement among students and teens now to make a big change in our society. It’s a leader’s job to turn up the heat, so to speak, just enough to feel uncomfortable. Betsy strives to push her students but also allows them to find a healthy balance. She feels passionately about this class and one can certainly glean that from her enthusiasm and dedication to her students.